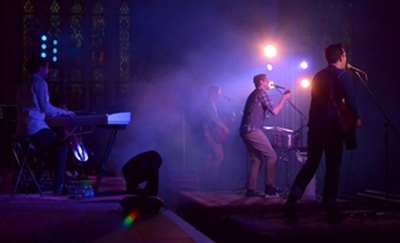 An eight-year-old ministry in North Carolina’s largest city is flourishing where many mainline churches are falling short: reaching 20- and 30-somethings, not just with a message and music tailored to that generation, but with a mission that sets this effort apart. Charlotte/One measures its success not just by how many people turn out on Tuesday nights but by how many are inspired to go to another church on Sunday mornings. “Our goal is to lose people,” said the Rev. Ross Chapman, the executive director of Charlotte/One. At a recent gathering, Chapman bounded onstage at First United Methodist to deliver a final sermon in a series on Jesus. The Gothic-style sanctuary, rented for a small monthly donation, had been transformed to look more like a concert venue than a place of worship. A giant “1” -- the Charlotte/One logo -- was bathed in blue light. Chapman, 30, wearing bluejeans and standing in front of the praise band’s drum set, told the gathering of 200 that Jesus was sent to “our neighborhood” as a man and not a God. He can fill our lives with hope because he knows what we are going through, Chapman said. He has endured what we endure -- even worse. With that, Chapman delivered the closing prayer, and then the crowd of young adults poured out onto the sanctuary steps on a warm spring night to slurp free Italian ice and share the fellowship that draws them here each week. Among the regulars is Ann Vo, 34, an underwriter for a home mortgage company. She didn’t exactly find Charlotte/One the old-fashioned way; she Googled “young adults in Charlotte” and ended up here, connecting with other young Christians. “It’s very hard to meet people my age in church,” she said. “This is our midweek praise-on,” said Kenya Crocker, 24. Vo and Crocker are among the several hundred young adults, most of them professionals, who belong to a local church while also participating in Charlotte/One. This includes the 24 Tuesday night gatherings planned this year, organized social outings and Serve Day community service projects. Both young women belong to a church -- 52 Charlotte-area congregations from several denominations partner with Charlotte/One -- thus embodying the principle on which the nondenominational ministry has built its success: the connections made on Tuesday nights are designed to inspire participants to find a local church to call home all week long. “We want to introduce them to Christ and to the significance of church,” Chapman said. Anyone who has sat in a mainline sanctuary on Sunday morning and noticed the number of graying, balding heads appreciates the challenge churches face trying to attract young adults. A 2007 Pew Forum survey found that a third of those under 30 say they attend worship services at least once a week, compared with 41 percent of those 30 and over. Brenda Hutchins, 26, speaks for many of the so-called millennials, those born after 1980, who embrace Charlotte/One. She belongs to a Baptist church, but it’s this group of her peers from across the region that quenches her thirst for fellowship. “This keeps me involved, not like some boring church thing you come to,” she said recently while volunteering as a Tuesday night greeter. It was his frustration over the failure of individual churches to connect with young adults that led the Rev. David Hickman to help start Charlotte/One in 2006. Serving at the time as young adult pastor at Mecklenburg Community Church, he assembled a half-dozen other young adult pastors to talk about creating a place where 20- and 30-somethings could meet their current friends and make new ones. For many young adults, Hickman said, bars and clubs were the only places offering that opportunity. The young adult pastors quickly agreed that on their own, their churches weren’t meeting the need. “Is there another model other than trying to individually offer something?” Hickman recalled them discussing. With Hickman as executive director, Charlotte/One started in May 2006 in the gym of Carmel Baptist Church on the south side of town. About 200 people turned out that first Tuesday night for upbeat music and a message Hickman delivered in what he calls “the language of the 20-something” -- conversational, nonthreatening, asking questions about the deeper meaning of life more than offering pat answers. The effort took off quickly, thanks in part to a $100,000 gift from a 28-year-old businessman who prefers to remain anonymous. The donor was new to town, came to the first service and was hooked. Charlotte/One took off, with several hundred or more soon turning out for each service. The Tuesday night gatherings moved in 2008 to First United Methodist Church in the heart of Charlotte’s booming center city. The uptown church offered the use of a 900-seat sanctuary for next to nothing, and it gave Charlotte/One the chance to re-brand itself as a ministry based in the heart of a city teeming with 200,000 bankers, lawyers, techies and other young professionals. It also made it easier for the young adults to go to dinner together after the service. “We like to say it begins when it ends,” Chapman said. The Rock Bottom Restaurant & Brewery a block from the church even offered discounts to its Charlotte/One clientele. 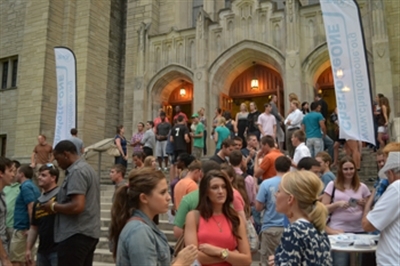 Attendance at Tuesday night gatherings peaked at 450 in 2011. So far in 2014, Tuesday night attendance averages 300. Hickman, 36, said the decline could stem from the fact that Charlotte/One is eight years old and no longer the hot new thing in town. Also, Elevation Church, with its rock-style music and upbeat worship services, has grown since its 2006 founding to some 14,000 worshippers in 10 locations in and around Charlotte. It draws from the same group of young professionals. But rather than competition, Charlotte/One sees Elevation and other churches as allies in the cause of connecting with young adults. Hickman left Charlotte/One last year to start City/One Network, an effort to launch similar ministries in cities across the country. Phoenix/One was the second to launch and now draws 800 to 1,000 worshippers on Tuesday evenings. Next up: Austin (Texas), Augusta (Ga.) and Aurora (Ill.). Chapman, married with an infant son, arrived in September 2010 from Indiana and succeeded Hickman in 2013-- driven, he said, by three passions: young adult ministry, local churches and unifying Christians across denominational lines. “I can do all three things at Charlotte/One,” Chapman said. Why does the mainstream church seem to be losing the battle to reach young adults? Chapman believes that many churches today are stuck in the past, sharing liturgy and traditions from 40 years ago that fail to resonate with young people today. In Hickman’s view, churches focus on churning out programs rather than offering young adults what they seek first: meaningful relationships, and people with whom to share their hopes and fears. He proposes that churches create mentoring programs matching a young adult with an older adult willing to share his or her wisdom and experience. "The answer to every question," Hickman said, "is people." Karen-Marie Yust, 50, teaches Christian education and spirituality at Union Presbyterian Seminary in Richmond, Virginia, and has been studying the digital culture and spirituality. Her reflections on why the church fails to reach young adults are also formed by the fact that she has children ages 19, 23 and 27 who have helped her navigate Facebook and social media. She said churches have not done as good a job as in the past at infusing children and youth with a religious identity. When these kids who came on Sundays with their parents reach their 20s and 30s, Yust said, they don’t necessarily come back to the church. The strength of the church today is in connecting with families with young children, she said. But many young adults are marrying and having children later in life. The single young adults focusing on building a career first? Often they find little at church that speaks to them. In this rapidly shifting arena, where reaching young adults can turn on everything from the music to the location to competition from the next big thing in town, Charlotte/One carries on. In 2013, more than 400 young professionals visited for the first time. About half the people who came to Charlotte/One connected in some way with a local church. Five new churches joined the partnership in 2013, bringing the total to 52 supporting congregations. Charlotte/One pursues its goal of getting young adults into a local church in intentionally subtle ways, trying not to be heavy-handed about it. Brochures and the like from some of the 52 partner churches are displayed on Tuesday nights, and Charlotte/One’s 52 partner churches are listed on the website. But mostly, said Chapman, the evangelism is done by word-of-mouth among the young adults, one conversation at a time. Charlotte/One in 2013 reported some success in this area: 48 percent of those who participated in the ministry connected with a local church on some level. And 35 percent of participants connected someone at Charlotte/One to their church -- the word-of-mouth communication Chapman talks about. The 52 partner churches come in all sizes, so it’s difficult to determine how many new members have come from Charlotte/One. Anecdotally, though, the reports are promising. The Rev. David Docusen of Center City Church said 50-plus young adults have visited his new church through Charlotte/One in the past four years, with about half becoming active. The church averages 150 worshippers on Sundays. Talbot Davis, of Good Shepherd United Methodist, said six to eight young adults from Charlotte/One have connected with his church in recent years. His church averages 2,050 on Sunday mornings. Chapman said that these words from John 17:23 capture the essence of the ministry: “I in them and you in me, that they may become completely one, so that the world may know that you have sent me and have loved them even as you have loved me” (NRSV). There’s a constant focus on getting the right mix of rock, folk and other styles of music onstage. About half of the 80-minute service now consists of music; the rest includes the sermon and announcements. Union Presbyterian Seminary’s Yust thinks mixing up the music with labyrinth walking and other nontraditional rituals might speak more effectively to young adults drawn to structure and pageantry. Finances are also a challenge. The 2013 budget of $250,000, most of it for salaries and other operations, is supported largely by individuals, churches and corporations. They pass the plate on Tuesday nights, but these, after all, are young professionals just starting their way up the salary scale. Chapman said there’s been conversation about the best location and the fact that after five years at First United Methodist it might be time to freshen things up with a new venue. The hot-at-the-moment South End neighborhood, filled with apartments, bars and restaurants, is one possibility. But on those Tuesday nights when the young adults come together at Charlotte/One, the future can wait. At the end of another pressure-packed day at the office, they come to connect with friends. Practice their faith. Share a meal. Find a faith home beyond this Tuesday night gathering of like-minded souls. Find what’s been missing in life. Courtesy of Faith & Leadership, www.faithandleadership.com. The views are those of the author and do not necessarily reflect the policy or position of the Florida Conference. Main photo courtesy Bigstock.